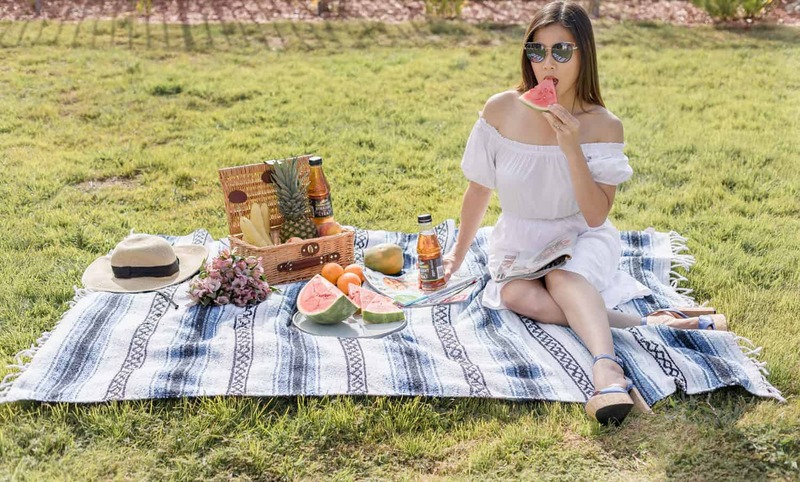 Are you looking for dinner ideas? 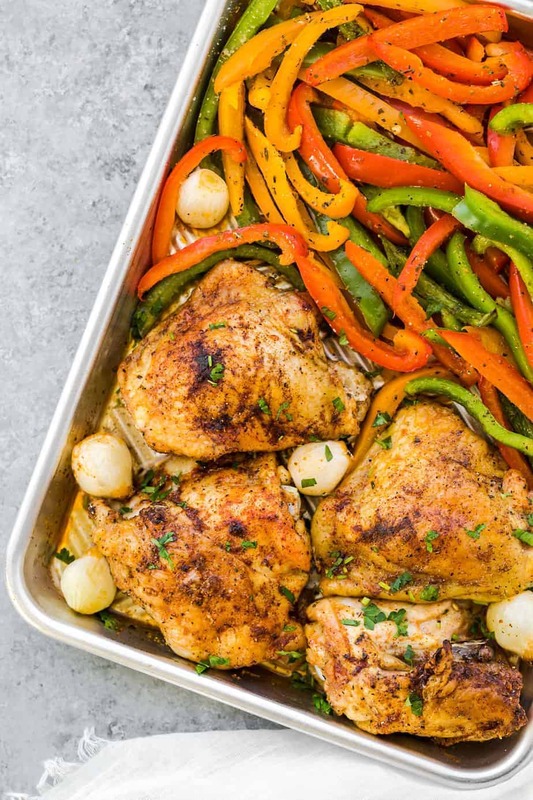 Try these easy baked chicken thighs with mixed bell peppers and onions. The chicken thighs were marinated in a simple spiced blend (Italian seasoning), garlic powder, onion powder, paprika powder and ground black pepper. You can view the complete baked chicken recipe below. 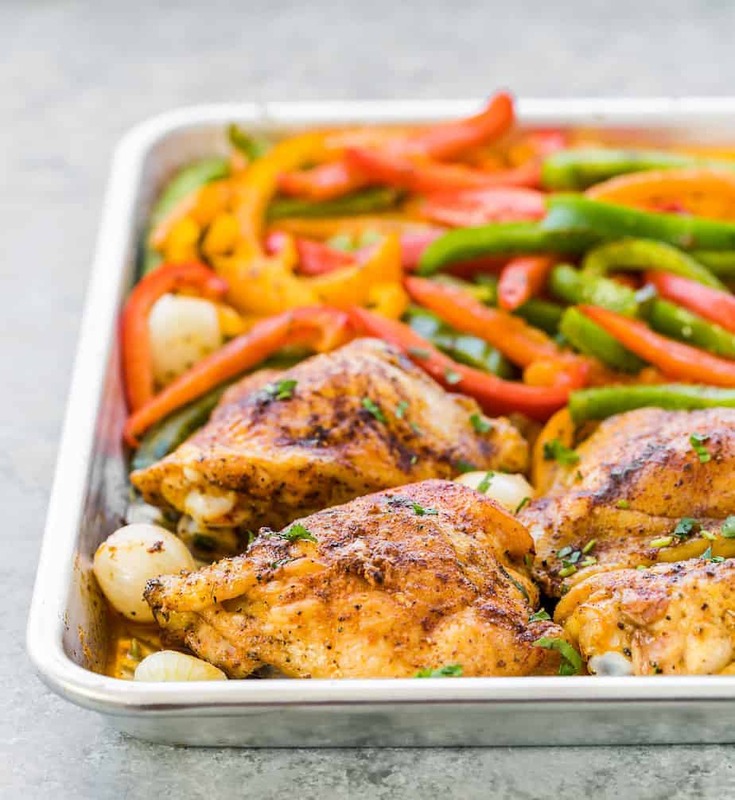 Hope you’ll enjoy this one pan chicken and veggies recipe! The result: Crispy, tender and flavorful chicken thighs! Hope you’ll enjoy this easy baked chicken thighs recipe! Place the chicken in a medium container. Rub the chicken with olive oil, garlic powder, onion powder, ground black pepper, paprika powder, dried thyme, dried oregano, Italian seasoning and salt. Marinate the chicken in the fridge (with a lid on the container) for at least 10 minutes. Arrange chicken thighs on prepared baking sheet (spray with cooking spray). Bake the chicken in the pre-heated oven at 350F for about 30 minutes. Pull the baking pan from the oven and add mixed bell pepper with seasoning. Continue to cook until the skin is crispy and thighs are fully cooked (about 20-30 minutes). Note: thermometer should read 165F when inserted near bone.